Annie Abbott, the "Little Georgia Magnet"
See or Order the Book !! The book described on this web site is the definitive story of Dixie Haygood, the woman who was the original Annie Abbott. The book is the product of years of extensive research using original documents, as well as Annie Abbott's diary and other the family archives belonging to the descendants of Dixie Haygood/Annie Abbott. The Harringtons have been the only researchers who have been granted access to the family’s archival materials. Annie Abbott "The Little Georgia Magnet" and the True Story of Dixie Haygood covers the story of Annie Abbott far more completely than the articles listed below. These publications just touch the surface compared to what is now known. The book is the first complete and accurate accounting of the story of the original Annie Abbott, the "Little Georgia Magnet" and her main competitor, Annie May Abbott. How the Annie Abbott Act Was Performed, The Linking Ring (published by the International Brotherhood of Magicians), Vol. 83, No. 6, June 2003, pp. 50-53. This article, along with the one below, received "Award of Outstanding Merit for the Best Series Published in The Linking Ring magazine" for 2003. Annie Abbott, The Little Georgia Magnet, The Linking Ring (published by the International Brotherhood of Magicians), Vol. 83, No. 5, May 2003, pp. 40-48. Georgia's Dixie Haygood: The Original Annie Abbott and "Little Georgia Magnet," Georgia Historical Quarterly, Vol. LXXXVI, No. 3, Fall 2002, p. 423-448. The "Georgia Wonder" Phenomenon, The New Georgia Encyclopedia (NGE) sponsored by the Georgia Humanities Council (a Web-based resource that presents a comprehensive and thoughtful portrayal of the State of Georgia) http://www.georgiaencyclopedia.org/nge/Article.jsp?id=h-2906, February 12, 2004. (Written with Steven Brehe). Dixie Haygood and the Magic of Her Annie Abbott Act, Remembering Milledgeville: Historic Tales From Georgia's Antebellum Capital, The History Press, Charleston, SC, 2005, p. 129-130. Dixie Haygood: Annie Abbott -- The Little Georgia Magnet, Bicentennial insert of The Union-Recorder (Milledgeville, Georgia daily newspaper), Section III, September 27, 2003, pp. 4, 6. October, 2001. At the Old Governor’s Mansion, Milledgeville, Georgia, Dr. Susan J. Harrington delivered a lecture on Dixie Haygood and Annie Abbott, the “Little Georgia Magnet,” to a packed house. 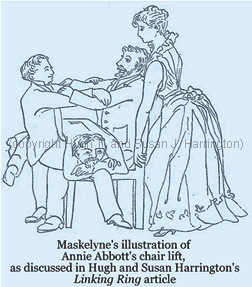 A demonstration of segments of the Annie Abbott Act was performed on the stage for the first time in almost 90 years. This event coincided with the dedication of a gravestone on the previously unmarked grave of Dixie Haygood, a.k.a. Annie Abbott, in Memory Hill Cemetery. "An Evening with Dixie Haygood," Oct. 28, 2010, Goldstein Center for the Performing Arts at Georgia Military College, Milledgeville, Georgia. Susan Harrington portrayed Dixie Haygood / Annie Abbott and David Wells portrayed Mr. Abbott (Richard N. Abbey). Harrington related some of Haygood’s experiences as an internationally famous performer and demonstrated part of the “Annie Abbott Act” that earned Haygood her fame. Wells directed the demonstrations of Annie Abbott's strength using GMC football players. Donations were accepted and received by Georgia’s Old Capital Museum Society. © 2019 Susan J. Harrington. All rights reserved. No part of this website may be reproduced or transmitted in any form or by any means without prior written permission. E-mail: info@NOSPAM_AnnieAbbott.com (remove the word, NOSPAM_ in your "To:" address, before sending your email).